I arrived in Hong Kong on Monday lunchtime for the second ‘international summit’ on genome editing amid stories circulating that gene-edited twin girls had been born to a Chinese couple. The editing, it was claimed, had targeted the CCR5 gene, with the aim of introducing a variant that confers immunity to HIV and some other viruses by altering the cellular receptors to which the virus binds on the surface of human cells. At first I was sceptical, recalling the alleged cloning attempts of reproductive biologists more than a decade ago, but discussions in the margins of the summit suggested that the claims had credibility. The doctor responsible for this was Dr Jiankui He, a PhD physicist who went on to study bioengineering in the US, and who is currently on leave from the Southern University of Science and Technology in Shenzhen, China (which has since condemned his work, along with the Chinese Academy of Sciences and almost everyone I have met in the last two days). He was on the conference programme for Wednesday, due to present in a session on ‘Human Embryo Editing’. There was a significant media presence throughout the conference which intensified conspicuously on Wednesday morning. There were many thoughtful and interesting presentations during the morning, which I might have reported. But the influx of a media phalanx that took up the right side of the auditorium could only be attributable to one speaker. After an admonition to listen with respect to what he had to say, He was announced and entered, after a tantalising hiatus, somewhat furtively, through a side door. He delivered his prepared presentation quietly. He then took a seat on stage between Robin Lovell-Badge, the session moderator, and US researcher, Matt Porteus. Before taking questions from the audience and the press, they did their best gently and solicitously to draw out the detail of what He was doing. 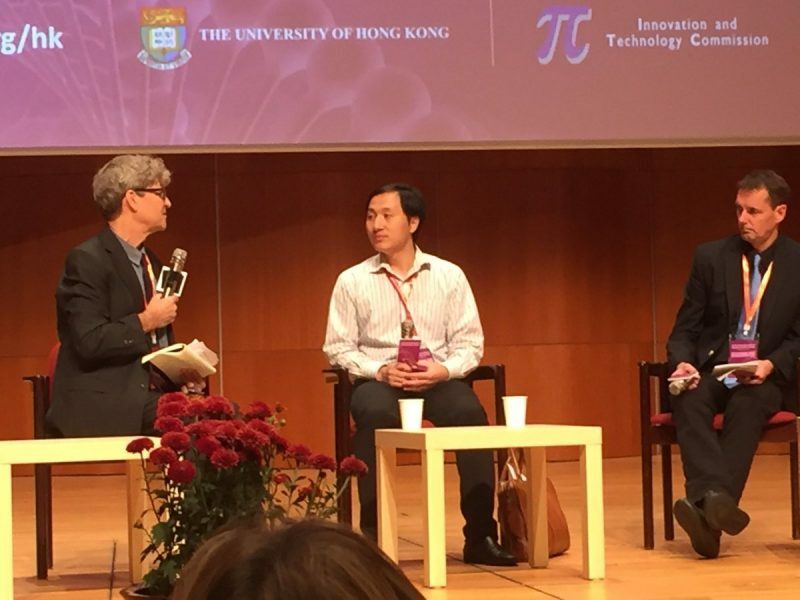 Dr Jiankui He – the scientist at the centre of the CRISPR storm – is interviewed by gene experts Robin Lovell-Badge (Crick Institute) and Matt Porteus (Stanford) at the Second International Summit on Human Genome Editing in Hong Kong. Photo by Peter Mills (used with permission). – Why did He choose CCR5 when there are established ways of avoiding HIV transmission during conception (the father had been diagnosed HIV+ but with a managed infection) and socially? And how much did He know about the other functions of CCR5, for example on the brain, where research has reported that CCR5 edited mice demonstrate enhanced cognitive ability (so was cognitive enhancement a possible secondary effect)? He replied that the edit was technically achievable. – Does He believe his intervention addresses an unmet medical need? And what responsibilities does He believe professionals have, beyond acting in accordance with patient consent? The prevalence of HIV in the patients’ population group is sufficient justification, He said. – Who was recruited to the study? What treatments were provided? Eight couples in similar circumstances (with HIV+ male partners) were enrolled. Thirty embryos had been created; two of these were transferred, resulting in the twin birth with one twin homozygous for the introduced variant (conferring HIV immunity) and the other heterozygous (not immune). Owing to the reaction, the study had since been paused. – How were the patients convinced to take part? They were educated and informed people, who gave their consent to the treatment. – What ethical approval and oversight was involved? There had been a consent process. – What was the consent procedure? The prospective patients had an hour-and-ten-minute interview with He and his staff. There was a 20 page form (which is in the public domain). It had been reviewed by four people and was discussed with the patients line by line, checking comprehension; the couples had the opportunity to take it away and decide later. – What about responsibility towards the children? A responsibility to help avoid HIV. But to these children (known by the pseudonyms Lulu and Nana) specifically? To protect their privacy and freedom. – How will the children be monitored? Arrangements were stipulated in the consent form, with the ambition to follow them up for 18 years and the hope that they will consent to participate after that. – How was the work funded? The basic research was funded at the university; He met the couples’ medical expenses himself; the technical aspects, such as the genome sequencing, were funded by a start-up business (in which He is involved). – Why did He ignore the salient view of the scientific community that treatment would be premature and irresponsible without a consensus on its acceptability? Why did he apparently transgress prohibitions in Chinese law? He took advice from US experts, He said, and of Chinese experts in the US. – Is He worried that the twins will be treated differently, given one has HIV immunity and the other does not? Will the immune twin, in due course, be a more desirable reproductive partner? We must respect the children’s autonomy, said He. – Did He expect the media attention? He had originally intended to publish his work in another form; the attention is regrettable. – Finally, would He use the technique for his own baby? If He’s future child were in the same situation he would be the first to do it. Then, when pressed by Matt Porteus, a revelation: there is one further, continuing, early-stage pregnancy. One could say that some of these questions were ‘leading’, but He’s replies were thin, and tended to revert to one of three motifs: HIV is a terrible scourge and enabling future generations to evade infection is a prima facie good; He had taken advice from experts in the US (and at one point cited US – not Chinese – public opinion research showing some support for reproductive genome editing); and the patients gave their consent to the interventions. My overall impression from He’s answers was of someone who really just did not know what he did not know, who simply was not aware of the norms and expectations of clinical research and innovation, and who was unaccustomed to critical reflection. He’s odyssey to becoming the first person deliberately to modify the nuclear genome of another human being involved some autodidacticism, seeking understanding at the feet of US experts who were willing to indulge him. He asked questions, but gave few clues to his ambition or to the state of his research. His story looks to me like a failure of socialisation into a research community that might otherwise have nurtured, directed and governed his interests and enthusiasm. In a brief response to He’s presentation from the podium, David Baltimore, a veteran of the Asilomar conference on recombinant DNA and biosafety in 1975, affirmed the continuing relevance of the statement issuing from the first genome editing summit three years ago: that much more research and more engagement aimed at developing a societal consensus is still needed. He’s work was, therefore, irresponsible. Irresponsible it may have been, but the creation of genome edited babies is now something that is a real part of the social world, not something that can be left behind in the laboratory or abandoned as a mis-step. This means that the scientific community has now to respond to it and to decide how to move forwards from here, rather than bracketing it out and returning to the path that they had hoped to follow in the first place. In this sense, though unwitting, Jainkui He’s intervention may prove to be as significant as the attention it has received suggests. This post has been republished with permission from the Nuffield Council on Bioethics. The original post can be found here.